asparagus Asparagus season is upon us! Traditionally the season starts (in The Netherlands that is) at the second thursday of april and ends at 24th of june. A warm spring will ensure that the asparagus are stocked from the end of march. Another reason to love spring time! The asparagus beds you can see alongside roads in rural areas are created to allow the asparagus to grow very easy, and to make harvesting them easy too. The asparagus beds are usually covered with (plastic) foil to shield the asparagus from having too much sunlight. This is also the reason behind the beautiful white color. Asparagus are best harvested by hand, when the first rays of sun heat up the earth. They should be harvested as soon and fast as possible when asparagus heads are sticking out the ground. If they are not harvested fast enough, they will start to discolor and tear. This manual labor explains why asparagus cost that much. After harvesting, the asparagus are sorted by color, size, appearance and quality. White asparagus that grow above the ground will become green asparagus. Usually these asparagus are grown for this specific reason. In taste, white and green asparagus are very different from each other. 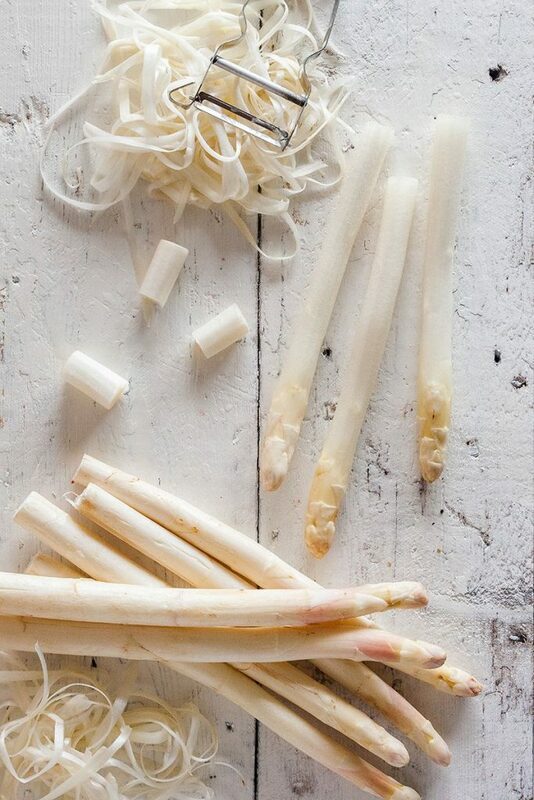 White asparagus are soft and tender, where green asparagus are firm and have a nutty flavor. 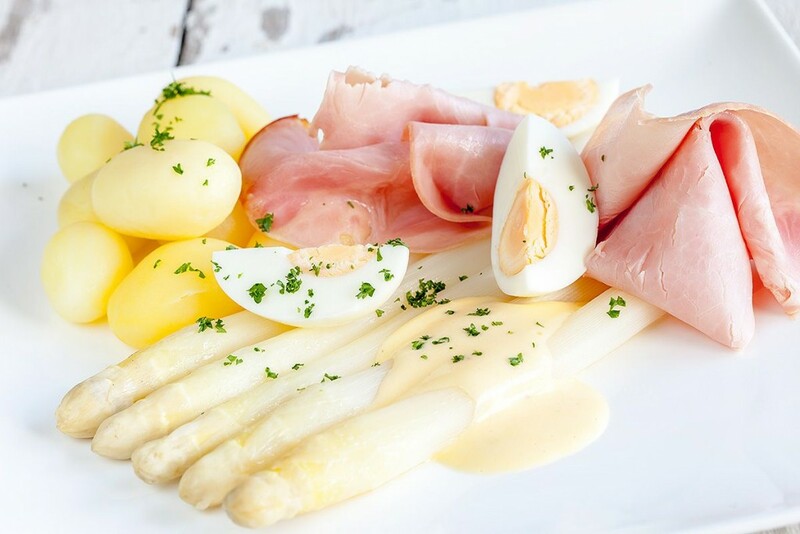 Whether you choose green or white asparagus, both variations have an amazing taste! Green asparagus do not need to be peeled, white asparagus should be because they are much more stringy. Asparagus can taste a bit wood-like or have a very stringy texture to it when improperly peeled. 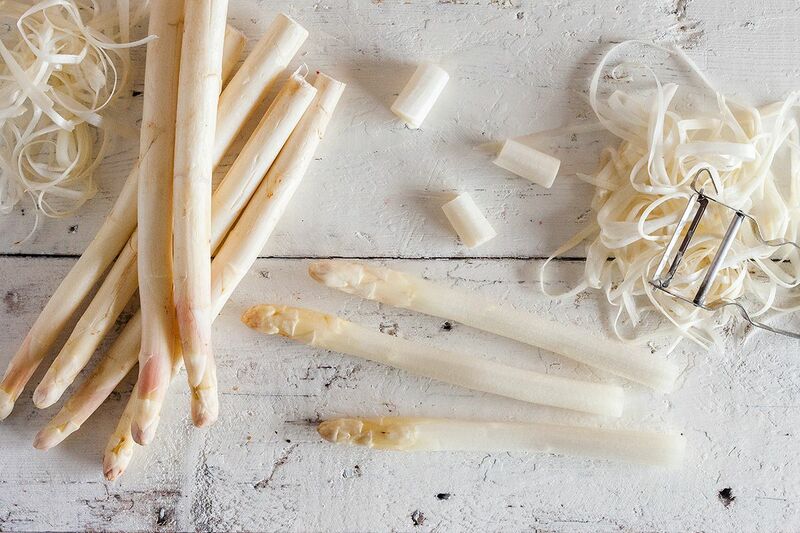 Make sure to double peel the white asparagus. This means that you go round the asparagus using a vegetable peeler while loosely holding the asparagus in your left hand. Turn the asparagus around while peeling from top to bottom. Start just underneath the tip of the asparagus, since the tip is the best part. Use your fingers to feel if you’ve correctly peeled the entire asparagus, then place it into a bowl of cold water to prevent discoloration. After you are done peeling, line all of the asparagus up on your cutting board and slice off about 2 cm from the bottom side. You can (if you want to) break the asparagus using your hands, this does take a little skill and you’ll end up with asparagus that differ in size. Trimming off the ends using a (chefs) knife is preferred by us. Save the shavings and trimmings though, you can boil some water and make a delicious asparagus soup with it. Click here to read our recipe for a creamy asparagus soup. You can boil asparagus in a specially designed asparagus pan, but a larger pan is also fine. Cook the asparagus for about 15 minutes, they are done when you are able to slightly bend them. Click here for our recipe for classic asparagus. You can find more of our delicious asparagus recipes by following this link, like one with serrano ham or as part of a quiche.